There was to be a basketball match for that day's PE lesson. The boys and girls would be split into two and play amongst their own gender, but they would warm up together before that... With two people paired off together for the warm-up, which would then take about 10 minutes and would involve stretching and passing balls. The students were free to choose their warm-up partner however they wished, the PE teacher wouldn't mind as long as they were all paired up. "... Which is why, this is a good opportunity for two people who rarely speak to have a conversation. I think it's great! So you go team up with Kitamura! End of story." "Team up with him... But who in the class would go and pair up with the opposite gender? I always team up with Minorin, and Kitamura-kun is always with you. Now you suddenly ask me to team up with him... I just can't do it!" "That's the whole point. Now listen up! The aim is to naturally and casually team up with him, all we need is some preparation. First, I'll team up with Aisaka..."
"Once that happens, Kitamura will have no choice but to team up with someone else. Along the way, the guy who gets paired with Kitamura will be 'accidentally' hit by a ball thrown by me. Though it won't hurt him, it will be enough to cause a commotion, since I'll have to take that guy to the school clinic. In that case, guess who'll be left behind?" "Right? This way you can go and say 'Looks like we have no choice but to team up with each other'..."
"You really are a terrible actor. Are you taking me for a fool? ...And are things really gonna run that smoothly?" "I'll do my best to make it run smoothly!" The two of them changed into their sneakers while sitting shoulder to shoulder, and then gathered with other classmates before the PE teacher. "Today... we'll practice passing the ball with a match." The teacher explained. "Now then, let's begin with warm ups! Everyone pair up!" "I'm here! Let's team up, Takasu-kun!" "... Right, dismissed! We seem to have some fired up spirits today!" "We've now passed the first stage without any problems." Both nodded and exchanged glances. "Hmm... so today's such a day, huh? Alright, I'll team up with a girl today! Who wants to be with me!?" Starting with this flirtatious voice. "Me too! I wanna team up with a guy!" "You're right, I guess it's fine this way as well." "Who knows? This could be fun!" The mood became excited, aside from those who stuck with their oaths to team up with their friends, the others with less integrity began to team up with the opposite gender. "Maru~o-kun! Oops, I mean Kitamura-kun! Team up with me!" "Huh? Ahh, sure, since I got dumped by Takasu..."
AH! Ryūji could hear a yell as he got smacked on the back by Aisaka. "W, wait, what's going on!? Kitamura-kun's now teamed up with that weird girl!" The one being called weird was one of the most popular girls in the class, Kihara Maya - Quite an elastic body for a 17 year old - She had extensions applied to her long eyelashes, while her lips were covered in a layer of thin semi-translucent pink lipstick. Wearing light makeup which only just made it past the school rules, she looked kind of cute... That's what Ryūji thought anyway. "What do you mean weird girl? That's Kihara-san. Don't go calling your classmates that! Though things didn't go according to... WHA!?" This time it was Ryūji's turn to yell. Minori leaped happily towards Noto. "Wha!? You!? Ehh!? Kushieda-san! Are you teaming up with that weird guy!? T, together!?" "I thought he was your friend? Really, that's why I said you are a useless dog! How can you not have foreseen such a thing?" "Weren't you the one who agreed to it!?" Just as the two tried to shove blame onto each other, the PE teacher's whistle echoed across the gymnasium. Everyone lined up accordingly and started to do their warm-ups. Standing ruefully before Ryūji, Aisaka started to move her body, shaking her ponytail as she went. The guys nearby who were close to her were repelled by her glare and clicking tongue, forcing the poor souls to quickly apologize and make a path for her to cross. No matter who it was (besides Minorin), anyone who gets in her way would get bitten. Thus the alias, the Palmtop Tiger, which is derived from her name. Ryūji remembered what one of his new classmates said when inquiring about Aisaka's alias. There was indeed a reason she was called a tiger, and unlike other girls, she didn't seemed too concerned about what Kitamura might think about her. Yet, looking at the girl warming up to the music from the radio, her small and thin figure, she just didn't seem like a girl to be associated with the word "savagery". The uninitiated would probably think of her as a fragile-looking pretty girl. Indeed, when she first entered this school, there were many who regarded her as one of the prettiest amongst the new students, and it was said that they queued up just to confess to her... Ryūji could definitely understand how they felt. Compared to other girls, she was one size smaller. A PE uniform that would just fit for others, would look much larger on her, and because of that she had to roll up the bottom part. Even her buttocks were as small as a child's. Overall, she belonged to the diminutive type. Frankly speaking, even though he was tormented by her up until now, Ryūji still thought Aisaka was "quite cute", though even that was only limited to her looks. This was because his heart could not lie; it began to beat faster upon making eye contact with her occasionally... neither did the sweat dripping from his face. "What are you spacing out for, you piece of junk? Ahhh, could it be you've already broken down?" "... S...say whatever you like. My brain does not waste space in having to come up with words to counter your sudden insults..."
The radio warm-up was now over. Aisaka coldly turned her head and sat down with her back towards Ryūji. Next were some stretching exercises. "... Why do I have to gladly do my stretching exercises with you? Come to think of it, wouldn't warm-up time be over by the time we handle the balls?" "Hey, you're quite delicate! It would be great if you could talk to Kitamura like this." As the empty conversation went on, Ryūji began to feel rather unsettled, probably because he was thinking of Aisaka's looks a while ago, now he couldn't help but start noticing her body. Below Aisaka's shoulder blades, her back felt a bit warm due to the warm up. Though it was by just a little bit, Ryūji could still make out the outline of her underwear from within. Ryūji thought to himself I think I've just given an awesome gift to all the guys in the class. "Ummph... Hey, you're getting heavy, stop pressing so hard!" On the other hand, Ryūji was concerned about Kushieda Minori. Was Noto looking at Minori's underwear outline from under her shirt as well? "... Ryūji, I'm... suffocating! Hey! You're heavy! Ow, hea... vy...!" "... Huh? Why do you look like you're in pain?" "Y... you'll find out in a moment... Come, swap..."
Aisaka smiled at Ryūji for the first time. Just what happened? Ryūji didn't understand. Did something good happen? About a minute later, it was Ryūji's turn to face his back towards Aisaka as he sat down. "Remember not to push too hard!" Ryūji said as he turned around. With its weight and momentum, this tiger was attempting to break Ryūji's back as it fell harshly on him. His waist felt like it was going to give in. "I was in quite a lot of pain as well a while ago, so now we're even!" This did nothing but waste all their energy. Finally, it was time to practice passing the ball. After being hit by Aisaka's flying kick, Ryūji's legs felt like they were about to crack. It'll be a miracle if I can continue the rest of the PE lesson like this! "Let's hurry up with our plan already, alright?" Aisaka said, standing about 5 meters from him. The other classmates also began passing their balls, the sound of balls bouncing echoed around the gymnasium. Diagonally behind Aisaka and diagonally in front of Ryūji, the person currently teamed up with Kitamura was Kihara-san - a girl. No matter how lightly he might throw, Ryūji was still hesitant to deliberately injure a girl. Anyway, let me pass the ball to Aisaka first! "... What the, how come you're passing the ball instead...?" Her large eyes reflected the light like a sharp blade, shooting directly at Ryūji. "... I'm waiting for a good chance. C'mon, pass me the ball!" With a scowl, Aisaka flung the ball back at Ryūji hard. As Ryūji caught the ball, Aisaka quickly gestured with her chin. "Hey! What the hell? Hurry up already!" The basketball shot towards his face like a bullet. Ryūji managed to quickly catch the ball after half of his face got scratched by it. By the way, Ryūji wasn't feeling mad, okay, maybe he was feeling a bit mad, but he was feeling scared a bit more. "Hey Ryūji! C'mon! Pass it to me!" Aisaka suddenly looked somewhere else, forcing Ryūji to quickly come to a halt. "What the hell are you looking at?!" In front of Aisaka's vision after she turned around... "Sheesh~ Kitamura-kun, just where do you think you're tossing the ball?" "My bad!" Kihara Maya began to chase after the ball that rolled off, which landed just in front of Aisaka's feet. Speaking of which, even Aisaka was not sure what expression to make aside from that as she picked up the ball. "Wah! Aisaka-san! I'm sorry, are you mad!? I'm really sorry, we didn't mean it!" Could it be because she's also a girl that it's easier to communicate with her? Kihara's smile revealed none of the terrified expressions the guys would normally make. "Can you pass it over, please!" Kihara waved her arm, and then realizing her shoelace was loose, quickly bent down to tie it. "Hey... Aisaka! Sorry about that, can you pass it to me please?" It was none other than the Mr. Nice Guy with flashy glasses - Kitamura Yūsaku. As expected of Kitamura, he treated every girl the same way, guess that's what people call being "innocent". Creak! Aisaka suddenly stopped functioning as though her engine had run out of gas. Ryūji could not see her expression from his position, though he could tell very clearly that her body was now as rigid as a springboard. "Cre~ak..." Aisaka started to move in a seemingly damaging way with all that creaking noise. She walked a few steps - right arm and right leg together, followed by left arm and left leg together - towards the ball. Without even saying "Look out!" or "Here I go! ", she silently tossed the ball over. Sorry, she hurled the ball over, and in a pretty pathetically rigid way too. Went straight into Kitamura's hand, who made a very cheesy V-sign on his forehead. By the way, he had his T-shirt completely tucked into his trousers, while the loose parts of his trousers were tightly wrapped around his legs. Aisaka, who seemed to like that sort of guy, had ceased all signs of life... At least it looks that way. She didn't even respond to Ryūji's calls as she stood still, not caring that she was standing in a spot that was obstructing other people from passing their balls. Ryūji quickly backed off. Aisaka Taiga was actually smiling! It was not easy to tell, but upon closer inspection one could see that she was smiling. "Heh, heh, heh, heh, heh..."
"H, hey... Aisaka, what's wrong?" "Heh... what now?! The one who's looking wrong is you! Why are you looking so stunned? You should be happy for me as well, like a dog." After hearing this unexpected statement, it was Ryūji's turn to become silent. Happy for what? Though Aisaka was pouting, she still appeared to be in a very good mood... Her hands were now grabbing her ponytail and had begun spinning slowly... Is she... dancing...? "Hey... Hey! Why should I be happy?" Aisaka stopped upon hearing the very direct question, she then scowled and exclaimed, "Wha?!" "What are you moaning about? Have you forgotten just what we have been fighting for? That's right, I see... since you are a complete and utter idiot anyway. Just how tiny is that brain of yours? Huh? Stop fooling around already! I have no time to waste with you! I'll tell you since I'm in a good mood right now! You wanna hear it right? Right? Ki, Kitamura-kun just practiced passing the ball with me! Heh heh..."
"... What's that supposed to mean?" "Huh?! Seriously, a dog has no right to complain..."
"... I'm not complaining... it's the way you're happy for... Sorry for being blunt, but aren't you happy for all the wrong reasons? When you said practice passing the ball... didn't you just simply pass the ball to him only once? Besides, was your goal just to practice passing the ball with him? Aren't you supposed to use that opportunity to start a conversation with him and get to know each other better?" "Furthermore, just what was that about? Did you even speak to him? Didn't you keep quiet the whole time? All you did was stiffly throw the ball out and he simply said thanks, and you call that a conversation?" Aisaka quickly turned and slammed her hand on the ball he was holding. As a result of the great force applied, the ball bounced very high up, nearly touching the ceiling. "You're right... Hmm, so you can say something useful once in a while! Then, let's continue with our plan!" With a high-and-mighty expression, Aisaka gave Ryūji, who was still writhing in pain, a kick and returned to her warm-up position. She immediately made a high speed pass. Ryūji wasn't even prepared when he grabbed the ball... more like, the ball smacked straight against Ryūji's chest. "Hey, hurry up and stick with the plan already. This time we must succeed." "... Well, you know... this plan..."
"What are you mumbling about? Weren't you the one that came up with this plan!? Practice time's almost up!" "What the hell are you waiting for, you lowlife... Ah, damn! Why does my nose have to itch now..."
Now's my chance! Ryūji fired away with the speed of a machine gun at Aisaka who was now busily scratching her nose. "How'd you manage? You look terrible! Speaking of which, you sneezed quite a lot last night, did you get a nose infection? Or did you catch a cold? Or is your nose too sensitive? Could it be that your nose was damaged by the reek from that horrid kitchen of yours? When was the last time you cleaned that place? You've probably never even cleaned your place, have you? Such a waste of a nice carpet... Oh yeah, where'd you get that carpet? It looks awesome, it's not made in Japan, is it? I'd sure like to get my hands on one of those..."
"What carpet?! Shut up already! Just what the hell are you rambling about? How should I know... Ugh... my nose... ugh... Ahhh, you're annoying! That's not important, hurry up with the plan... ugh...~!" Aisaka now frantically scratched her nose while feeling very peeved. Looks like she's about to explode! "Hey, pass it over! Paaaaa------sssss!!!" Aisaka exclaimed loudly while waving her arms around like Spider-Woman. Her eyes read "If you actually throw this towards me, you're dead meat!" "Okay! I'm gonna pass, Aisaka!" This time Ryūji used a lot of strength in his throw. The two sounds that echoed around the gymnasium were Aisaka's sneezing and Ryūji cry of terror... I didn't do this on purpose! I swear! It wasn't deliberate! "I, I'm sorry! You okay... whoa!?" As Ryūji rushed to help pick Aisaka up, he suddenly became startled. This is bad. S, she's fainted, and her nose is bleeding... For some reason, the images of Inko-chan and Yasuko this morning flashed before him. They were both lying on the ground in awkward poses, and now Aisaka was the same as well. Could the scene from this morning be an omen for what is happening now... And why am I thinking of all these meaningless things at a time like this!? "What's wrong, Takasu? Who's hurt? Is it Aisaka?" "T, this is bad! I'll take her to the school clinic right away!" As the crowd murmured, Ryūji hid Aisaka's face against his chest and bolted towards the clinic. The excited guys behind started yelling, "The Palmtop Tiger actually got taken out by that amateur Takasu!" "Now this is an interesting development!" Aside from the general direction of the plan, nothing was going according to plan. Takasu Ryūji started to become serious, mainly because of what had happened earlier. I didn't do it on purpose, but... Though she's the Palmtop Tiger, still... I made her faint and gave her a nosebleed... While he feared Aisaka's retribution, he feared his conscience even more. "Aisaka! I know it's a bit sudden, but do you wanna have lunch together? I want to make up for what happened during PE, is that okay? Kitamura, Kushieda, why don't you join us as well?" And so, Ryūji began his "Operation Having Lunch Together". By casually inviting Aisaka, who usually ate with Minori, to have lunch with him, who usually ate with Kitamura, she could happily have lunch with Kitamura, and he could happily have lunch with Minori. It was an impeccable plan! "Sounds good! This is a great combination! Then let's move our tables together, alright? Kushieda, Aisaka?" "Yeah, sure! Let's eat together! Hey, Taiga, come over, Takasu-kun says he wants to eat with us! He says he wants to make up to you for what happened in PE... Hey! Stop standing there in the corner!" "We don't really need four tables, two people can share one table each." Minori quickly landed in one of the chairs. "Then I'll sit here!" As Ryūji was looking at her, Kitamura had already taken another chair. Needless to say, there was only one thing that Ryūji wanted, and that was to sit next to Minori. The table was wide enough to sit both of them together very closely, so it was a great seat. However, Minori was already patting on the chair next to her and had begun to open her mouth. Probably to say "Taiga! Over here!" Ryūji pretended to trip and discreetly bumped into Aisaka's back. Ryūji naturally breathed a sigh of relief, and sat wearily next to Minori. I wonder if that was too exaggerated? Ryūji thought while lifting his head. "What's wrong, Aisaka? Your food's gonna spill if you shake the desk too much. You sure look energetic!" "What are we having today~ What are we having today~ What are we having today~ ... Aha! We're having fried nuggets! C'mon, all together! 'Fried nuggets~'..."
Kitamura and Minori still remained cheerful in their own distinctive ways. Rather, it was the surrounding classmates that started to murmur amongst themselves. "Now that was some dance by the Palmtop Tiger and Takasu!" "Amazing indeed!" ... Prepared. She had no intention of opening her bento box; meanwhile her expressionless face was stiff and ridged. She placed her hands by the box and her eyes flashed with a dangerous glitter. Aisaka can't even speak properly to him, perhaps it was too soon to have her have lunch with Kitamura? "Hmm, so Aisaka also brought a bento. Did your mom make this? Or did you make this on your own?" "Eh? Takasu? The one who made your bento was Takasu?" Ryūji couldn't help but yell. "What's wrong?" 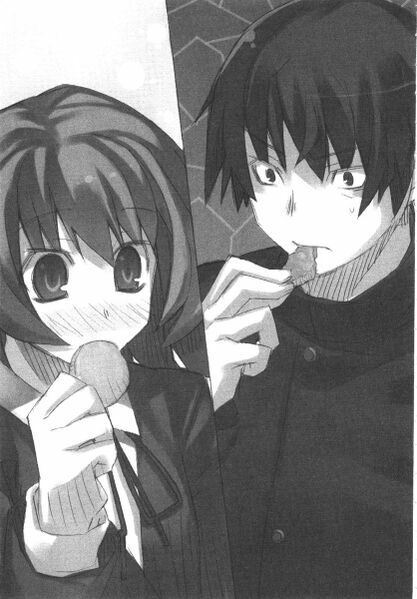 Kitamura looked at him, while Minori stared intently at her nuggets. Ryūji was frozen stiff, stunned by his own stupidity. Wasn't I the one that helped prepare Aisaka's bento!? Not to mention the contents of our bentos are exactly the same. If Kitamura and Minori see this, what are they gonna think!? His trembling hands held tightly onto the lid of his bento box. What am I gonna do? Ryūji took a quick glance at Aisaka... No good. She's completely bedazzled by Kitamura, just like a deer in headlights. Do I really have to show them the simple ingredient lunch we are having together? Aisaka's eyes rolled everywhere, not knowing what to do, while still pointing her chopsticks at Ryūji. "Takasu, what's wrong? You look terrible." "Huh? Is someone looking for me?" Kitamura looked past Ryūji, causing Ryūji to turn around as well. Standing where Aisaka pointed her chopsticks, that is right behind Ryūji's head, was a first year male student calling out "Kitamura-senpai! Kushieda-senpai!" "Isn't that our first year manager?" "Sorry guys! Turns out we got stuff to take care of." "I'm really sorry, there seems to be an emergency club meeting, so our underclassman came to tell us that we have to drag our bentos and rush over to the club room right away. Taiga, Takasu-kun, we'll be going ahead first~! Let's eat together again next time!" After frantically packing their bentos and apologizing, they quickly left the classroom. Ryūji became even more frantic. Aisaka Taiga was now very depressed and rested her face on the bento box. She covered her face with her hands and wearily hung her head very low - Her shoulders were already small to begin with, now they looked even smaller as she wrapped herself up like a fur-ball. Noticing that she seemed to be muttering something, Ryūji listened intently, and he heard what sounded like mantras being chanted, "Why? It was such a good chance! I was too unlucky! Why!? I don't understand, at this rate..." As well as whole bunch of curses being uttered in quick succession. She must have been really nervous and was still hoping for something good to happen... Ryūji was at a loss for words. But he couldn't just leave her like that. "... W, we'll invite him for lunch tomorrow again, okay? ... Anyway, let's eat first, alright?" "Does this mean you're going to smack my face with a ball again?" "Didn't you use me as an excuse in order to invite Minorin and Kitamura-kun? You can't casually invite them without a reason, can you? Or do you have another plan? I definitely do not want something that direct! Absolutely not! Absolutely...!" "O, okay, okay! Here! Let's eat!" Aisaka's lashes began to get wet as she talked, so Ryūji quickly stuffed a potato into her mouth with her chopsticks. "Are you sneezing? Don't worry, I've got plenty of tissues!" "No, you idiot! I was just thinking how I was about to die back there!" Aisaka gulped down the carton of milk on the table. Gulp, gulp, gulp... By the time she put down the box, her tears had already dried. Breathing a sigh of relief, Ryūji began to eat his own bento. Good thing Kitamura had to leave, or he would have really run away and left Aisaka alone and behind. Then god knows what she would have done. Thinking about it, Ryūji felt like it was a blessing in disguise. Aisaka, who was originally in a bad mood and had remained silent, now lifted her head and stared at Ryūji. "Can it be helped? My house isn't the sort of place where you can readily find meat in the refrigerator. If you want meat, go and live with those sort of families!" And so, the two of them silently ate their lunch. Observing the entire spectacle the whole time, the other classmates began to wonder: "Just what's going on?" "How did this happen?" The dynamic duo was just too amazing, but no one dared come up to personally ask them. An air of surreality had filled the whole classroom of Class 2-C... The day had finally come to an end. Neither Ryūji or Aisaka had noticed this surreality. Both had experienced painful setbacks during PE lesson and lunch. This was the last chance for today! No matter how small the result may be, they had to at least leave some kind of impression inside Kitamura's head. "... Are you ready, Aisaka?" "Ai, Aisaka, deep breaths! Remember to breath deeply!" In one noisy corner of the classroom, Aisaka wore a serious expression. Even Ryūji wore one, mostly out of guilt, which bound his entire body like a chain. "I'm getting nervous already... Won't it be too bothersome to do something like this?" "Why are you saying things like that now that we've come this far? Relax! It's rare for guys to feel unhappy at receiving hand-made cookies from a girl. Besides, Kitamura likes sweet things, and he isn't the type to turn down hand-made stuff. Moreover, he doesn't seem to hate you..."
You bet! Ryūji nodded his head, allowing Aisaka to relax her stiff expression a bit. Carefully held in her little hands were the cookies that she carefully baked during Home Economics class. As that class was co-ed, no one would think too much about giving hand-made food to the opposite gender. Indeed there were guys hoping to receive leftover cookies from the girls, and girls making extra cookies on their own in order to give some to their boyfriends. Without letting anyone see her, Aisaka secretly (mostly using Ryūji's body as a shield) spent a lot of effort making all sorts of colorful cookies. And so, they came up with a plan to casually give the cookies to Kitamura, codenamed "Operation I Made Extra, Would You Like Some". This would give Kitamura a good impression of Aisaka. However, things did not go quite as planned. Of the ten extra cookies secretly baked, six were roasted into charcoal... This is all thanks to that hopeless tiger getting the oven temperature wrong! Moreover, in order to destroy the evidence, all six of those roasted cookies ended up in Ryūji's stomach. Only four pieces survived without harm. Aisaka Taiga, your success depends upon these four pieces of cookies! Aisaka held her fist tightly while nervously holding the cookie wrapper to her chest. Looking at her anxious expression from 30cm above, an ominous feeling grew in Ryūji's heart, I wonder if that nervous expression is going to lead to any disasters? "Anyway, listen up! Don't push things too far, just try and act as though it's nothing! And don't get nervous all of a sudden..."
"Yeah, I know. Relax, right? Relax... relax..."
"Alright! Everybody back to your seats! Homeroom's about to begin!" Aisaka got startled by the voice of the homeroom teacher. Amongst the students rushing back to their seats, the 145cm tall creature slowly wobbled into the aisle. Once everyone had greeted the teacher at the end of class, she would have to quickly call out to Kitamura... That was the order given to her by Ryūji. As Kitamura is usually busy, he will probably head to the Student Council first thing after school. Once he's done there, he still has club activities. If you just sit there daydreaming, he'll be out of the classroom before you even realize it! Ryūji took a quick glance at Aisaka back and sighed. Although he knew Aisaka would be nervous, he never expected her to be this nervous. Aisaka grabbed hold of her desk, her back arching as though she had a stomach ache, her feet shaking violently, and her face turning pale white while looking like a demon. "Oh my~... There's quite a sweet smell in the classroom today! Let's see... flour, sugar, butter... Ah, that's right! You were making cookies for today's Home Economics right? I lo~ve cookies! Hee hee hee, how nostalgic... I can still remember baking cookies with my homestay family while I was studying abroad in England..."
"... Y, you mustn't make such noise in front of a teacher..."
"... U, umm... It's not nice for a girl to make such noise..."
"... Ahhh, my words cannot reach the heart of my students..."
In the end, she covered her face in her hands and began sobbing. Knowing it'll come to this, wouldn't it have been better if she had just shut up? She just had to take on something that was beyond her power. It's no wonder she's still single. Clatter. The sound of someone standing up, it was Kitamura. "It seems there's still some time before homeroom session ends, how about letting me handle the rest as Class Representative? Besides, a lot of us have club activities afterwards, so I believe it would be better to discuss this tomorrow morning!" "... I don't understand what Kitamura-kun's trying to say..."
"... We've got art and craft tomorrow, so don't forget to bring your stuff! Everyone stand! Bow! Goodbye~ Sensei~!" "Goodbye~ Sensei~!" Everyone repeated. Okay, let's go home! Thus homeroom session was unilaterally ended by the students. The single lady (let's not repeat this) sniffed and said, "I'm really not suited for this job." And left without saying anything else. She dropped her bag on the floor, she was already beginning to panic. Such a clumsy girl! Now where's Kitamura? Ryūji turned to look around. "Goodness, it's this late already... I'm so gonna get scolded by the President." "Forget your bag, just call him out already!" "Ah, um... Ki, Ki... Ki..."
What the hell, man? Ryūji scratched his head in frustration. Aisaka had stood up and stretched her arm towards Kitamura's bag, but his name just wouldn't come out of her mouth. As if she had been struck by a spell which caused her to forget how to utter "Kitamura-kun", she was now close to tears as she opened and closed her mouth continuously. "Damn! He's left already! Hurry up and go after him!" As he nudged her tiny body, she quickly took off and started running. Ryūji also gave chase in long strides. If I let this clumsy idiot run on her own, who knows what trouble she'll get herself into. Clutching the packet of cookies at her chest, Aisaka and Ryūji left the classroom in pursuit of Kitamura. At the end of the corridor, they spotted their target turning at a corner. "Out of my way! Scram!" "Sorry! Can you please let me through?" Ryūji requested simply. "Whoa! 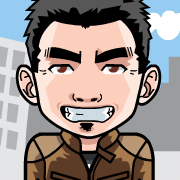 It's Takasu!" "The two bosses going after each other!" ... Once again the Red Sea parted. It looked like Ryūji was still regarded as a delinquent outside of Class 2-C, causing him to pause in depression. Now's not the time to fret about this! Ryūji quickly picked himself up and started to give chase again. Then he suddenly realized, it didn't really matter if he didn't catch up with them. It'll be fine as long as Aisaka can call out to Kitamura, and all I need to do is make sure she does it. As Aisaka came to the final step, she tripped and began to fall backwards, just as Ryūji had turned his glance upwards. After the yell, an incredible force only seen during a disaster was awakened. Ryūji "flew" at an incredible speed. As elegant as a baseball outfield player, he leapt to the half-way platform and miraculously caught Aisaka within his arms. However, as the impact was too great, Ryūji's back crashed into the wall behind him as he carried that little figure with him. Umph! Ryūji grunted in a comical way, his eyes widening due to the sudden pain. Within his vision, he saw a familiar packet flying out of Aisaka's hands in an arc, out of the window. What had fallen were those four cookies that they worked so hard to bake. "AH!" Aisaka made a scream and stuck her arm out of the window. But it was already too late, as they had long fallen outside. Aisaka... Ryūji noticed he had wanted to speak but could not, as the pain in his back prevented him from catching his breath properly. Though his voice was weak, Aisaka could still hear him. She held tightly into Ryūji, unable to say anything, her expression froze as though she had just eaten something poisonous. I'm fine... It seemed he could breathe a bit, so Ryūji waved his hand towards her to signal that he was alright and there was no need for her to look so worried. "... H... Hurry... Retrieve... the cookies..."
Ryūji could barely make some noise, and then he slowly pushed Aisaka off. This was partly driven by Ryūji's determination You worked so hard to make those cookies, even though I helped along the way. I too wish for them to be given to Kitamura. He wanted Aisaka's determination and hard work to be properly conveyed to Kitamura. "Ryūji, are you alright?! ... Ahh, how did this happen..."
"I'm fine. So... Here, see? I'm not hurt at all." "Hey! Who's throwing stuff out of the window!? Show yourselves now!" Ugh! Both of them groaned. It was the ultra-mean School Dean. As it had came to this, there was no longer any time left to bring the cookies to Kitamura. "... Such perfect timing. Looks like it can't be helped, hurry up and go get scolded by him then hurry back up, I'll wait for you in the classroom." "... But... Then I'll carry you to the classroom first!" "Don't bother, I can still walk. So hurry on, we don't want this to get any more troublesome." Hurry up, go on. Ryūji gestured her to leave by pushing on her back, while Aisaka fretted her brows and turned her head many times towards Ryūji before finally walking down the stairs. During this time, the teacher's voice was getting more and more fierce. Aisaka needs to hurry up... Speaking of which, has there ever been anyone capable of scolding the unchallengeable Palmtop Tiger? I really have no idea. "... Phew... Looks like I used it up..."
Now it was just him alone, Ryūji walked slowly while talking to himself. He remembered what Yasuko had told him while he was in elementary school. Yasuko said she was a so-called "mi~ni esper", in that she had the power to teleport randomly three times during her life. She used it the first time when she was still a kid, where she encountered a traffic accident and was flung off twenty meters, she managed to teleport herself to safety before she could hit the ground and get herself injured. The second time was when she left her home in order to give birth to Ryūji, during her journey to meet the beloved man who liked sticking a magazine on his abdomen. Yasuko didn't go into details, all he knew was that it was thanks to her teleportation ability that she managed to safely reach that man's side. And, as for the third and final time, she said, "I'll leave it for Ryū-chan to use! Ya-chan no longer has any need to use that power." She then slapped her hand on the still-little Ryūji and transferred her power to him. Yasuko added, "If you encountered something dangerous, then use this power, and return safely to Ya-chan!" In the end, Ryūji used this power only to help Aisaka. He was tempted to use it whenever he was running late for school, or during many other occasions... Good thing I never used it till now! Though he felt bad for Yasuko for using it like this, that was what Ryūji genuinely thought. "Are you sure you're really alright?" "I've told you a million times already, I'm fine!" "Good. Though you're my dog, I'd lose sleep if you got hurt..."
Aisaka said softly, leaning her forehead against the window glass. Can't believe you actually have the guts to say that after trying to break into my house and kill me with a wooden blade... Ryūji had wanted to say, yet for some reason, he remained silent. After retrieving the cookies and returning to the classroom, Aisaka's voice had become very weak, it seemed like she had gone into depression. The silent classroom after school was empty, with only Aisaka and Ryūji inside. 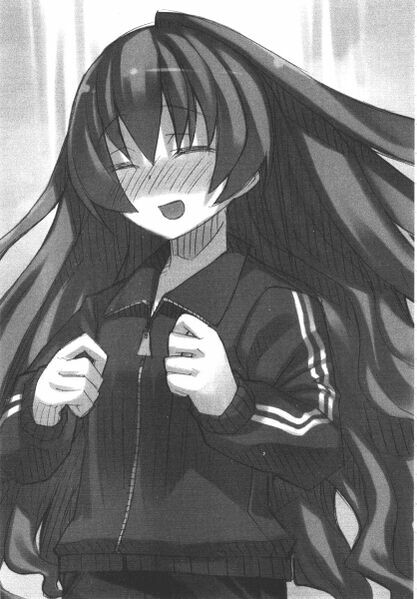 Aside from Ryūji, no one else had seen this side of the Palmtop Tiger before. "... I'm always a failure, nothing ever comes out right..."
Her self utterances no longer had the enthusiasm she had earlier in the day. "This is only the first day of our effort, so it's actually not surprising that we haven't succeeded yet." "... Is that so? But if I wasn't so clumsy, if only I was a bit smarter... even you got affected. Nothing has been going smoothly, has it? ... I've had enough already..."
Aisaka leaned back on the window and slid down. Sitting beside Ryūji's legs, she wrapped up her tiny legs. "For the past seventeen years I never realized... but now I know how clumsy I am..."
"If you want to say it, then say it clearly!" "You too... even Ryūji thinks that way, huh? You must think I'm hopelessly clumsy beyond help, right?" As he lowered his head, he found himself exchanging glances with Aisaka, who was looking up. She rested her cheek on her knees while her eyes quavered with sadness. Her usual attack mode had vanished, replaced with unsettlement in her eyes - mostly caused by her self-lamenting. "... Well, it was actually my fault during PE lesson, not to mention the plan itself was too incomplete..."
"It's not just that, there's also my clumsiness..."
Aisaka wearily closed her eyes, as though recalling all the chaotic events of the day. Once he realized that Aisaka was the one who threw that packet of cookies out, the Dean knew it was impossible to reprimand her, so he quickly let her return to the classroom. "... So much for making all that effort to make those cookies... and... sigh..."
As Aisaka muttered to herself, she noticed a small scratch under her chin. It was caused by her chin rubbing against her buttons while Ryūji saved her from getting injured. She softly caressed the scratch while taking out the packet of cookies from her pocket - all that was left were the few pieces of crumbs that didn't fly off. "Writing a love letter, but placing it in the wrong bag; trying to beat someone, but instead fainting from starvation; getting hit by the ball while practicing; finding people for lunch, but they had to leave; accidentally roasting the cookies, tripping, falling and dropping them out of the window; and... all these... this is just..."
"Oh, and you forgot one more... forgetting to put your letter in the envelope!" Ryūji was trying to joke to cheer her up, but the way he expressed it didn't feel right. Sinking into sadness, Aisaka buried her head into her knees and went quiet. Squatting down in an awkward pose, she wrapped herself tightly and remained still, like a snail burrowing into its shell; only her tiny fingers could be seen trembling. Her soft hair hanging from her shoulders moved slightly with the rhythm of her breathing. Women are just so devious. No matter how arrogant they may be, or how much trouble they may bring to others, as long as they made that expression, they would quickly melt the heart of any man. This expression was impossible to ignore. So Ryūji scratched his head, and intensified his glare. He first went to his desk, then returned to Aisaka, and sat down next to her. Ryūji tapped her shoulder in order to get her to look up, while pretending he didn't see the tears in the corner of her eyes. He placed his baked cookies wrapped in a very manly aluminum foil on her lap, and then he took her cookie wrapper in exchange. Ryūji gently opened the very battered wrapper; there were only a few pieces of crumbs inside, though there was still quite an amount. "Eh... wait... Ryūji, those were just picked up from the ground, a, and they're..."
"Since I only ate your roasted cookies before, I'm really curious to know what these taste like!" "A, are the cookies... delicious?" Aisaka worryingly widened her eyes. "Yeah, they taste great! Ah... too bad you can't give these to Kitamura. Better luck next time, eh?" "Uwah... Amazing! They look perfect. Can I really eat them?" "I wanted to take them back for my mom, but I guess it doesn't matter, they're all yours." Her eyes widened as she put them in her mouth. "... This is the first time I've heard you say the word 'tasty'." "This is incredible, it's so much better than those sold in the bakery!" "According to my experience, for bakery products, it always tastes better if you make them yourself rather than buying them. Of course, this has to do with my personal preference, but for those who like their cookies suitably soft after coming out of the oven, I'd prefer baking them myself." "I see... um... I... like this, I really do!" Aisaka looked just like any other normal girl as she concentrated on eating the cookies. "Delicious!" She said with her cheeks stuffed with cookies, she licked the sugar around her lips and added quietly, "It'd be great if it was served with red tea!" Besides me, who else would recognize this side of Aisaka Taiga? An incredible feeling. Until yesterday, like many other classmates, he too had feared the "Palmtop Tiger". He not only feared being bitten, he also feared having anything to do with her world. So Aisaka Taiga is this kind of person... Back then, he was hardly even interested in such things. This girl... the daughter of some infamous gangster boss or karate master, a cruel girl who treated people like dogs, got so nervous upon seeing her crush that she forgot how to speak, an unbelievably clumsy girl, and then got depressed to the verge of tears due to being ashamed of her clumsiness... She was always hungry, and loved tasty food and snacks. She was an extremely peculiar girl... always causing trouble for people, and giving people a headache. But Ryūji suddenly realized he did not dislike her peculiarity. He even thought, I'm glad I met this kind of person. At this moment, he felt blissful for some reason. "... Hey, Ryūji! I think I know now!" Returning to his senses, he saw Aisaka Taiga staring at him from a very close distance. Though her face was small, her complexion was fair, her large and nearly transparent eyes glittered with stars every time she blinked, those were really beautiful eyes. Even though she was small, her face was hardly child-like... Ryūji suddenly realized all this, and something resembling a cold shiver went up his spine. "It's all because you didn't help me out properly! You're such a dumb dog! A hopelessly dumb dog!" What the hell!? Aisaka shrugged her shoulders and looked contemptuously at Ryūji. How should I put this... Looks like she's herself again... But still, what the hell!? Ryūji was really getting pissed, thinking, How can there be such a person!? Yet, he saw Aisaka give a gentle smile... Forget it. I'll let her off this time! Think of it as a special offer from me! On the way back, they kept some distance between each other, though they were headed in the same direction. Approaching the school gate, Aisaka, walking ahead, stopped in her footsteps. From her position, one could see the track field beyond the trees. "... The softball club. Minorin is there." Aisaka pointed ahead, running energetically under the sunset was none other than Minori. As though she was carrying a prism, in an instant only Minori remained within Ryūji's vision. But Ryūji understood that Aisaka was not looking at where her finger was pointing. Her eyes were fixed towards one of the dark-haired guys on the other end of the field doing warm up exercises. It was Kitamura. Stopping in her footsteps, Aisaka stood still, her cheek was dyed caramel by the orange sunset. A soft breeze blew, yet Aisaka remained still. She must really, really like Kitamura Yūsaku. "... Hey, can I ask you... why Kitamura?" "I'll be going ahead first. Why don't you stay here for a while longer?" She appeared to be trying to change the subject. Though it didn't matter whether she answered his question or not, since even Ryūji didn't know why he asked that. "... You're going ahead first? What do you mean?" "I'm sure you want to stare at Minorin with those horny eyes of yours for a bit longer. You can forget about me helping to arrange for you two to get together, but at the very least I can let you look at her for a while longer! She's beautiful, isn't she? So I understand why you chose her... I'm not that unreasonable, you know! Come to my house to make dinner at eight tonight, that is all!" What do you mean "that is all"?! No, what do you mean "come to my house to make dinner"... No, what do you mean "that is all"?! Her clumsiness mode set in again as she tripped over the lining in the tarmac... Her bag flew out of her hand as she fell without warning like a small child. "Ah! Ah...! Just what are you doing?!" Ryūji sighed deeply and rushed towards Aisaka and picked her up while she muttered, "Shut up! Leave me alone!" After picking up her bag and patting off the dust on her skirt, Ryūji noticed that Aisaka's knees were full of bruises... She must've tripped a countless number of times when no one was watching. "What'd you want for dinner? You don't have any problem with me eating with you, right? I'll make my mom's share and take it home with me, okay? You'll be paying for the ingredients, right? Oh, I remember your refrigerator's empty. In that case, we can't do anything without going to the supermarket first... Oh yeah, we gotta buy some mold removal liquid and dish washing detergent!" Can't be helped, I guess... Ryūji thought. "So be it!" Aisaka exclaimed. This was because she had no way of refusing. After yesterday and today, he knew this girl was stubborn, unreasonable, self-lamenting yet also obnoxious. Threatening her was useless; when she decided to do something, she would do it. Not to mention, there were so many things that he was worried about her. Which is why... I can't just leave her alone like that. Can't be helped. Besides, there were still plenty of dirt marks in Aisaka's European kitchen that bothered him.